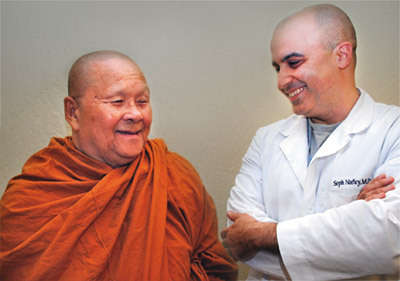 Dr. Seph Naficy shares a light moment with Khamphanh Nettavong during a followup appointment after his surgery. Spread over 5 acres amid a stretch of fertile farmland just outside the Central Valley city of Ceres is the Wat Lo Buddhist temple and monastery. There’s no place in the world where 74-year-old Laotian immigrant Khamphanh Nettavong feels more at ease. For the past 10 years, he has made a home here as a monk, leading a quiet life of austere routine and meditative tranquility. That sense of calm, however, was shattered one spring morning last year when he experienced recurring chest pain and numbness in his left arm. He phoned his eldest daughter, Anna Nettavong, a Vallejo resident who had him transported to Solano County. Eventually, he wound up at the NorthBay Medical Center Emergency Department. of Seph Naficy, M.D., a member of NorthBay’s Heart & Vascular Team. Via a CT scan, Dr. Naficy determined that the monk’s pain was being caused by an enlarged thoracic aorta with a large penetrating aortic ulcer. The defect had been spotted previously by doctors at other institutions. But they told Nettavong that there was little they could do about it, aside from monitoring his condition and prescribing blood-pressure medication. That the aortic ulcer was wedged in a bed of calcium and close to the main blood vessel that comes off the arm, apparently made surgery too risky. Ana Nettavong listens to her father, Khamphanh, talk about his life in the monastary. Dr. Naficy traveled an offbeat path to NorthBay. After training extensively as a cardiac surgeon, he craved something more and began a two-year training stint at University of Tennessee, Memphis, Tenn., with an emphasis on endovascular technologies. There, he developed an intense interest in “hybrid” approaches to the treatment of cardiac and vascular diseases. Dr. Naficy preferred a relatively unusual alternative, but one that would present fewer complications, less stress on the heart and lungs, and a reduced risk of infection or renal failure. His plan: Combine elements of open surgery with elements of minimally invasive endovascular surgery. He would re-route the blood going to the patient’s head and place a stent in the arch of the aorta, which is a large artery that carries blood and oxygen throughout the body. This would be done without opening the chest or arresting the heart. 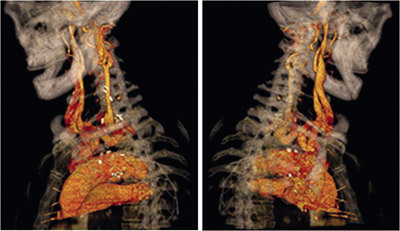 This 3D CT scan shows the patient after the procedure, which included bypass of both neck and left arm vessels, followed by stent graft placement in the aortic arch, through one small groin and two small neck incisions. Anna Nettavong remembers her family being “very nervous” when Dr. Naficy explained his plan. But after conducting some research, she placed her confidence in him. “I knew that if we didn’t do it, there was a chance my father could die,” she says. Following the procedure and a stint in rehabilitation, Mr. Nettavong was able to return to the colorful surroundings of his beloved monastery and the company of his fellow monks. “It was the best feeling—like I was reborn. My spirit just rose,” says Nettavong, who, reportedly is pain-free and more active than he had been. “I can’t keep up with him,” Anna says. Meanwhile, Dr. Naficy regards the successful procedure as a testament to teamwork and the hybrid approach that he hopes will be more prevalent in coming years.